It’s been ages since I added some new work to my Forgotten Postcards series. With the next Brussels Accessible Art Fair quickly approaching in June, I’ve buckled down to work on some new pieces which I post over the next few days. Although a few of my early postcards were from Kinderdijk, in the Netherlands, I realised that I hadn’t done any of my former home, Amsterdam. I took the original photo for this Forgotten Postcard a few years ago. It’s one of my favourite houseboats in central Amsterdam, located near the Anne Frank museum. The script and postage marks are taken from scans of real old Dutch postcards and the piece contains about 8 layers of texture. 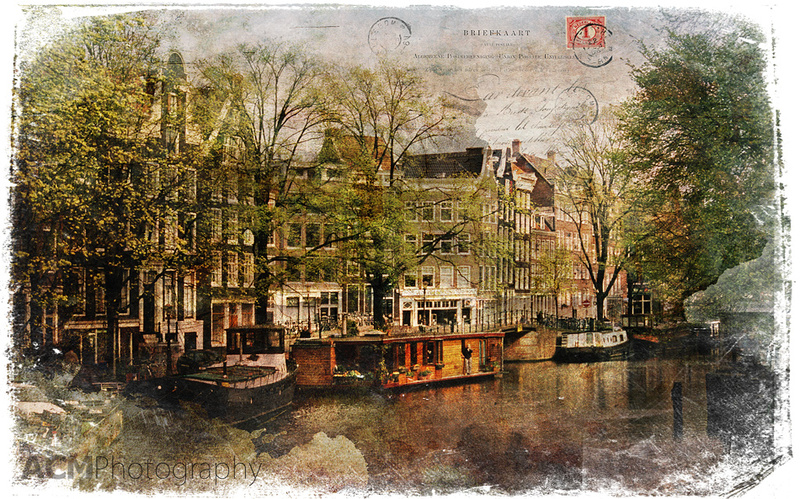 This entry was posted on Friday, March 5th, 2010 at 16:33 and is filed under Digital Art, Forgotten Postcards, The Netherlands, Travel and tagged with Amsterdam, art, canal, collage, digital, forgotten, holland, houseboat, netherlands, photoshop, postcard. You can follow any responses to this entry through the RSS 2.0 feed.